Looking to move? An environmentally friendly way to lighten your load, pad your wallet and discover great new shopping destinations in the area is to sell your clothes to a pre-owned clothing boutique. Lucky for DC, MD and even VA residents, there are many to choose from! What should you look for when choosing a place to sell? Most secondhand stores have systems for buying that determine how much sellers will earn and most have criteria for what they will take. It’s also important to consider price points when you research how each store compensates sellers. Each store may also have their own vibe and brand, which also influences what they will buy and how much they might pay for your items, i.e. a store that caters toward teenagers will be looking more for low-cost, fast-fashion pieces whereas more upscale consignment stores are better for vintage brooches and other valued items like designer bags. Buffalo Exchange is a national chain of stores located in 20 states and in Washington, DC. The nice thing about this particular store and some others in this list is that you can either trade for a store credit or receive cash (note: not all clothing re-sale stores give you cash up front). Keep an eye on Buffalo Exchange as they sometimes hold events! Reddz is not a national chain but a local chain! With stores in both Bethesda and Georgetown, they are another great place to sell clothes and support small businesses! Reddz also buys for cash or trade and they also accept menswear. Do note that they stop buying one hour before closing. This is not an uncommon practice so be sure read store sites carefully when preparing to sell your clothing and plan accordingly. I am a bit partial to Re-mix because at one time I worked here! This little gem of a store buys and sells both men’s and women’s clothing. They sell a mix of new and used clothing and accessories. Like the aforementioned stores, they also buy for cash or trade – so you can always trade in your old clothes for brand new items. They also sell these awesome regional Popco Tees so you can boast your DMV pride around town. 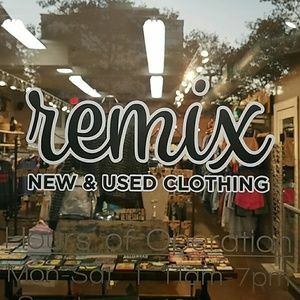 Remix is a local store with one location, so once again, doing business with them is a great way to support small businesses in your area. Current has a nice blend of fun fashion and designer finds. While they are similar to some of the aforementioned stores, they do differ in a few ways. The biggest difference is that they are consignment shops so sellers do not get their cash up front. Read the seller page carefully to get a feel for how it works. There are some great advantages to working with Current that also set them apart from some of the other stores: they pick up from your home or you can mail in your items – you don’t have to go to the store if you don’t want to. They also have a really great online store, so not only do you have the opportunity to sell your clothes on their retail floor but a buyer might see them on the online store as well.